We would be foolish if we didn’t try to jump on the “Groupon goes IPO” mixed with the “Bash Groupon/Gaopeng because they’re not no.1 in China” bandwagon. 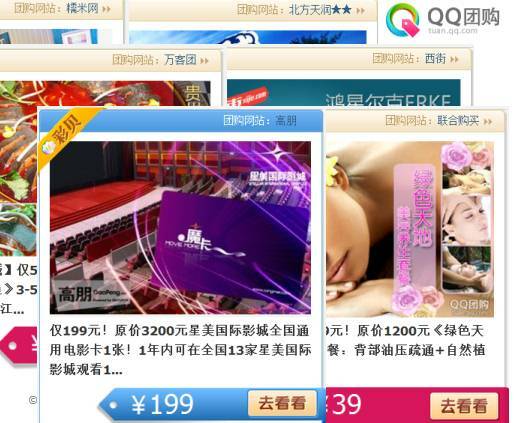 So here we go, “Groupon makes it into the Top 10 in China”. Considering that they place themselves at 12 in China in their IPO roadshow that should be at least something positive. In September’s report our special is about how Tencent, yes, the one that has partnered with Groupon in China, worked hard to infiltrate itself in different forms in our top 10. Enough is enough, and after leading the pack for several months it was decided to kick their daily deal website QQtuan out of the rankings. The main reason for this is that they have become too much of a sales platform selling daily deals from other websites. At the same time one of their investments, Ftuan, accelerated in September into the Revenue top 3. An explanation for this is that Ftuan’s average deal price is one of the highest. Last but not least, as mentioned before, they have a stake with Gaopeng ranking no. 10. All in all Tencent is doing well in the Chinese daily deal space. The number of new deals is still increasing, but they generated again on average less and less revenue as well as less Nr. Sold. Gaopeng gets into top 10 by revenue; QQtuan becomes a sales platform.